Chelsea defender Tomas Kalas says the pressure of helping loan club Middlesbrough push for promotion from the Championship is an incentive. Kalas, 21, made his debut in Saturday's goalless draw with Reading, a result that left Boro fourth in the table. The Blues ended Kalas's previous loan at Cologne this month after he failed to make a single appearance. 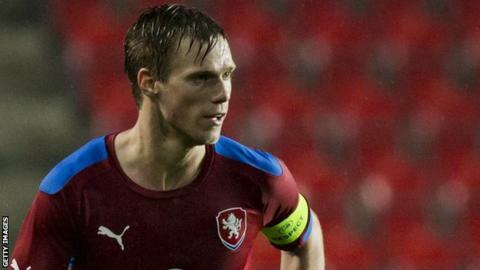 "It would be different if I went to a team without pressure of promotion or relegation," Kalas told BBC Tees. "It's similar to pressure in the Premier League - it's a good thing for Boro with wanting to be promoted and to be playing for first or second place. "Chelsea want me to play as much as I can, so hopefully I can help Middlesbrough to get promoted so it will be worth it for me and the club." Boro boss Aitor Karanka brought Kalas, the fourth Chelsea player to make a Teesside switch this season, in to bolster the squad following the injury to Rhys Williams. Forward Patrick Bamford and defender Kenneth Omeruo are currently based at the Riverside, while goalkeeper Jamal Blackman returned to Stamford Bridge last week after a half-season loan. "When I came I knew some of the players, so it was easy to ask about how things go with game-day, training, food, everything," added Kalas. "It was helpful Patrick and Kenneth are here." Karanka praised the Czech Republic international for his contribution on debut, filling a troublesome right-back berth. He has played at centre-back and full-back for Chelsea and loan club Vitesse Arnhem, but is likely to feature in the latter for Boro with Damia Abella and Williams both out long-term. "It doesn't matter if it's centre-back or right-back, even left-back," said Kalas. "I guess I've played most on the right or in the centre. "I think of myself more as a centre-back but if I can play right-back I wouldn't say anything about it. I will always try my best." You can hear the full interview with Tomas Kalas on BBC Tees Sport listen again by clicking here.